Steve Ballmer's had a mixed time at Microsoft. He took over as CEO when it was completely dominant in the desktop PC market, and he leaves with it... still really quite dominant. Apple's had a bit of a go at it of late, and there was that year when people thought Linux might spread out of the niche DIY self-build banana crate enthusiast computer market, but when Mr Average buys a PC in 2013 it's still got Windows on it. And announcing his retirement lifted the share price seven per cent, so that's... nice. But if you were judging Ballmer on the weight of public opinion alone, you'd think he was the worst company boss in history, presiding over deaths, switching the core of the business to manufacturing a variety of toxic gasses and insisting everyone eats 20 Brussels sprouts before being allowed to check their email. He's hated, most likely only because he's a bit mouthy, stroppy, sweaty and tends to shout. But now he's on his way out, everyone on the internet is slapping him on the back and wishing him a relaxing and long retirement, right? Not exactly. On Business Insider, someone called Someone claims Ballmer's problem was that he simply didn't have a nerdy enough background to thrive at MS or present himself to the public as a visionary figure, pointing out that: "Bill Gates at least is half a programmer who knows how to motivate talented people to outdo other talented people. One key point in this plan is the leader has to genuinely sound smart. Bill Gates sounds very smart even when he appears with other heavyweights like Steve Jobs. Steve Ballmer could only make fun of himself being dumb." Or, as vendetta247 puts it a bit more strongly: "MS would have been better using a chimp and a multiple choice selection to make decisions." 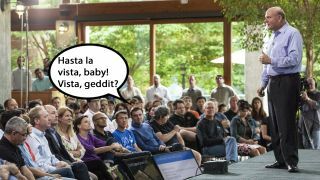 Or has the big man just been a victim of poor timing and a harsh, fashion-led conspiracy against boring old Microsoft? AverageJoe on Entrepreneur reckons it's a coolness issue: "Over the past 5 years, somehow, it has become 'cool' to hate on Microsoft. A lot of this has been due to Mac fan boys mindlessly repeating marketing material, and to a lesser extent to the hipster crowd toting their Apple products around everywhere they go." In response, Vipre416 claims it's more to do with the "decades of abuse" heaped on users by Ballmer and his various tech teams, adding that Microsoft was guilty of "almost single-handedly creating the anti-virus market with the crappy OS products." Gamers invaded the discussion over at ZDNet, where talk turned to the Entertainment and Devices Division, which encompasses Xbox and is blamed for recent flops like Zune and Kin. Poster Matthew_Maurice reckons Ballmer shouldn't have bothered with Xbox at all and left the money in the building society, saying: "Microsoft would have been much better off buying Apple stock or oil futures than developing and selling the Xbox. Hell, you could even make the point that with the Surface fiasco, they didn't even get valuable hardware development experience from it." Someone rather keener on Microsoft replied, probably from his Surface RT, saying: "...like the Xbox before, the Surface tablets only need time before they can become successes. The Xbox took time to become the best, and the best seller, and Surface tablets are going through the same growing pains." Yeah, sure, and it's only a matter of time before those new Zunes come along to obliterate the iPod touch range. As for speculation over his replacement, Guardian commenter Undecidable isn't on the side of potential candidate Stephen Elop from Nokia, saying: "Yeah, he's done a stellar job at Nokia. Microsoft should definitely consider taking him back if they're looking to liquidate in the next 10 to 15 years." But Ballmer has some friends on the internet he can rely on to always thumbs-up and five-star his comments, such as Oppo Fanboy on The Verge, who says: "Ballmer doesn't get enough credit, for most of his tenure he ran a company that had its hands tied by anti-trust measures, which none of its competitors had. "It would have been easy for Microsoft to fade away and become a footnote in history. He has kept the company going and kept it going very well." Which sounds like Oppo is impressed by people who manage to remember to feed their pet dog every day for a decade.